Most of the reindeer in Alaska are grown under an extensive management system, that is, they are allowed to graze freely over large ranges instead of being kept in small pastures where supplemental feed is provided. Though the ranges are vast by most standards, care is required to keep these ranges healthy. The objective of current range management studies is to evaluate the effect of species, maturity, season, and environment on fiber and mineral concentrations in plants found in ecological sites used significantly by foraging reindeer on the Seward Peninsula. For a more comprehensive description of these efforts, click here. We are also interested in the ways that reindeer select forages throughout the growing season. They are very selective eaters and tend to pick only the plants or plant parts that are the most nutritious. During the summer reindeer graze on grasses, sedges, forbs, and shrubs. During the fall however, they transition to a winter diet that is made up almost entirely of lichen. We are currently investigating the seasonal shifting of diet composition and habitat selection of free-ranging reindeer on the Seward Peninsula in relation to the seasonal changes in species composition and plant characteristics between habitats. Here is an explanation of why this is important. 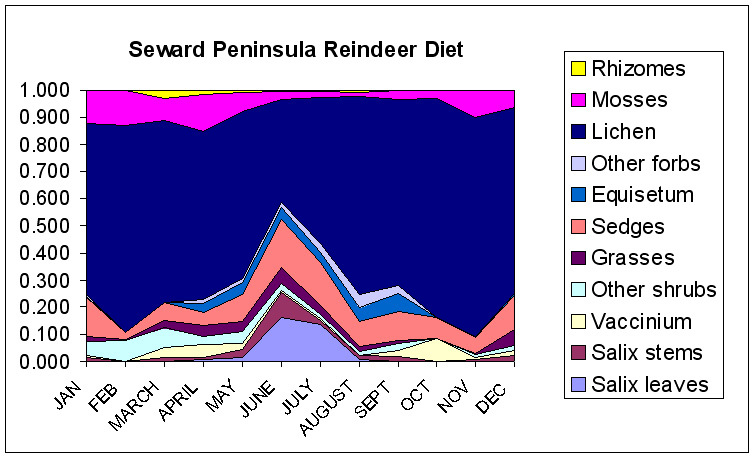 You can also take a look at what reindeer eat throughout the year. The goal of the reindeer industry is to provide a stable meat supply and an enhanced economic base for the people of Alaska. Currently, most Alaskan reindeer production is found on the Seward Peninsula, where reindeer are allowed to range freely over large grazing areas. However, further expansion and development of the industry in other areas of the state is possible if a low cost feed is available for intensively managed herds within fenced areas or for supplemental feeding of free-range reindeer. One of the objectives of the Reindeer Research Program is to determine which locally grown feed ingredients and pasture grasses (and in what proportions) can be used in reindeer diets in a nutritious and economic manner. Here are more details. You can also view the formulations and nutritional profiles of our rations. Locally produced feed ingredients for use in captive reindeer diets. Utilization of forage to optimize reindeer production.